Canyon Point, Utah. I’ve been down this road before with Land Rover. Well, not this very road, but some very much like it. Allow me to elaborate. Eight years ago, in the wilderness that is rural Vermont outside Manchester, yours truly, behind the wheel of the then-new Land Rover LR4, battled a diabolical off-road trail that stretched for about 40 kilometres and close to four hours. There were ruts. There were fallen trees. There were rocks galore. Throughout the journey, the LR4 was unstoppable, hesitating for only the briefest of moments as it scrambled for traction on the rain-slicked surface. The ability of Land Rover vehicles to make molehills out of mountains was further reinforced for me during my first visit to Utah some four years ago. At that time, the brand new SUV on display was the Range Rover, and the challenges were even more extreme. An off-road trail through the least populated part of the continental United States eventually led us to a rock climb that defied both logic and gravity. When the location of the global launch of the all-new Land Rover Discovery (the replacement for the LR4) was announced as taking place in and around Canyon Point in Utah, it stood to reason that we would be driving the same rocky off-road route. After all, home base for both events was the luxurious Amangiri Resort in the heart of precisely nowhere, and the notorious rock-strewn route was just a short drive away. But we don’t tackle the thinly disguised goat path again; in years since Land Rover has staged an event in the area, it has uncovered even more challenging terrain for us to conquer. The initial miles pose little challenge for the latest Land Rover. At launch, there are two versions to choose from: one with a supercharged 3.0L V6 gasoline engine (340 horsepower; 332 lb-ft of torque); the other, dubbed the Td6, motivated by a turbocharged 3.0L V6 diesel engine (258 horsepower; 443 lb-ft). The engines benefit from a collection of advances designed to boost efficiency, including automatic start/stop, a real-time fuel economy readout, and simplified driveline and exhaust systems. Both the diesel and the gas engine are linked to an eight-speed automatic transmission engineered by the people at ZF, the sultans of gear swapping. A rotary dial allows the driver to engage gears and select sport mode; steering wheel–mounted paddle shifters can be brought into play should the mood strike. Neither of the two engines is bothered by the two- or four-lane blacktop that takes us from the airport to Zion National Park, although, to be fair, passing power is not a particular strength of either. 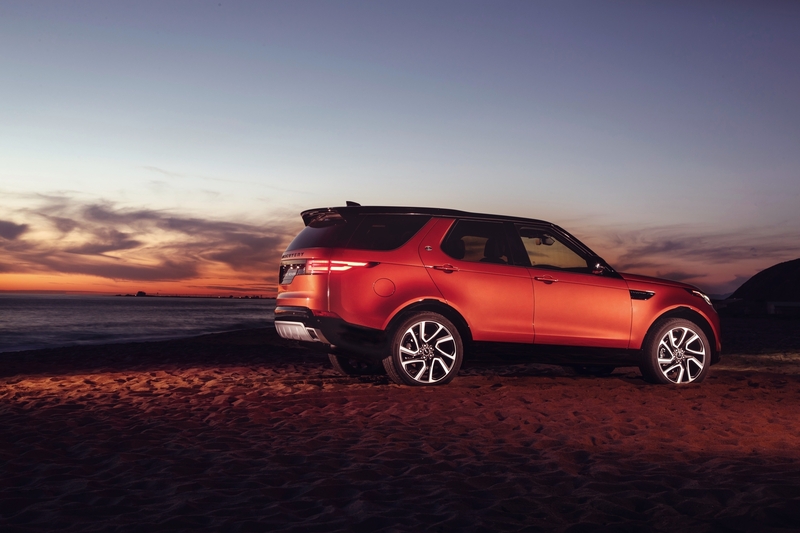 Amid the visually arresting backdrop of crimson canyons and outcroppings, the design of the new Discovery makes a bold statement. On the surface, the latest Land Rover resembles a scaled-up version of the Discovery Sport, which was introduced just last year. 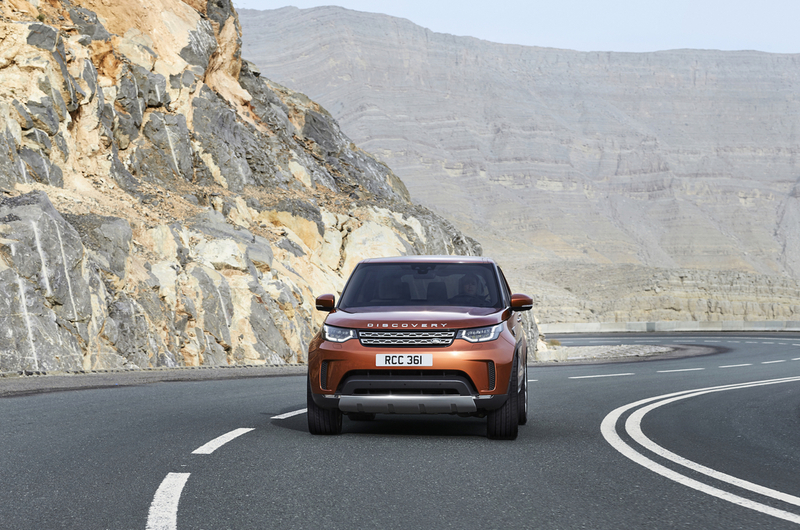 The coupe-like silhouette is familiar to other Land Rovers and Range Rovers, including the Discovery Sport; the rounded-off shape is less so. This full-size SUV is longer than the LR4, which is itself a mammoth conveyance, but its dimensions are deceptive and the bigger story is beneath the surface. While a bigger vehicle does not usually mean a more efficient one, Land Rover has dug into its bag of tricks to make sure the opposite is true in this case. In terms of overall length, the Discovery is 140 mm longer than its predecessor. 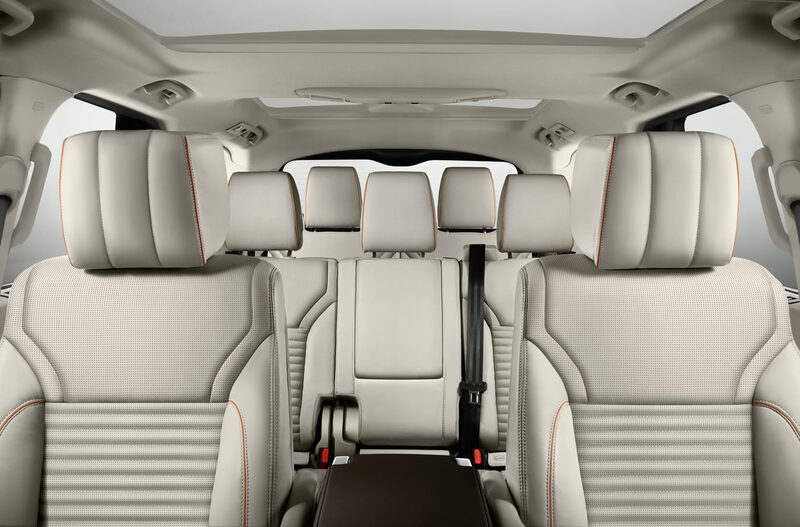 The wheelbase is stretched by 38 mm, which creates an impressive amount of space for passengers in the second row and (optional) third row. Despite the Discovery being 40 mm lower, it boasts superior ergonomics overall. 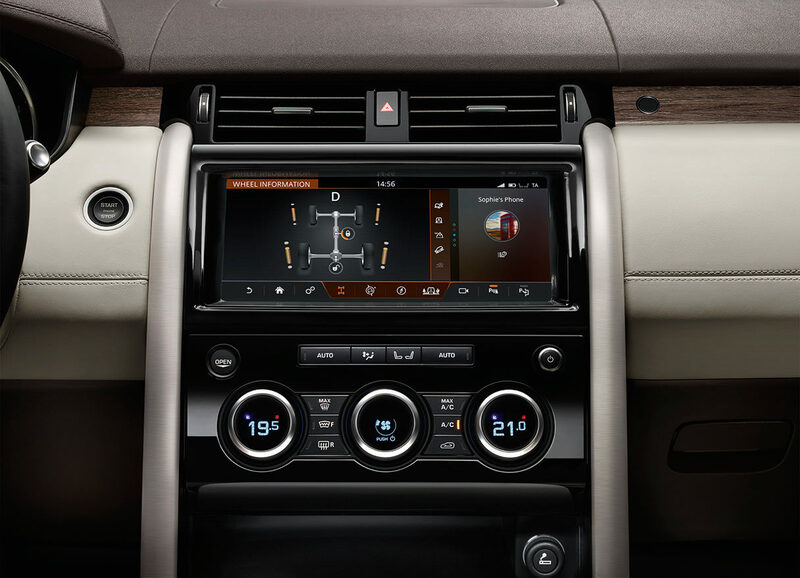 Also, the second- and third-row seats can be power operated using switches inside the tailgate or the C-pillar, through the infotainment touchscreen, or remotely using a smartphone app. While a bigger vehicle does not usually mean a more efficient one, Land Rover has dug into its bag of tricks to make sure the opposite is true in this case. The construction of the Discovery consists of 85 per cent aluminum, a direct contrast to the steel used throughout the ladder-frame construction of the LR4. The result is a massive weight savings of some 480 kilograms. The lightweight construction of the Discovery isn’t just a benefit when it comes to fuel efficiency, the engineers say. It also leads to improved driving dynamics on-road and off-. On-road, the Discovery is certainly quiet, composed, and luxurious; it’s also far closer to Range Rover levels of refinement than the LR4 or any of the earlier generations of this vehicle. But once the pavement recedes into the distance, the new Discovery really shows its worth. Over the course of some 650 kilometres, we venture off the beaten path on four separate occasions and tackle four different degrees of challenge. The first excursion is a mere meet-and-greet affair, a quick blast through a scrub brush–marked trail where the surface varies from hardpacked to mildly loose sand and dirt. Here, we allow the latest version of the Land Rover Terrain Response System to take control. Although this system allows the driver to select programs to cope with specific off-road conditions, it also has an automatic setting. This lets the on-board computer vary the torque split of the four-wheel drive system, alter throttle response, adjust the suspension, and respond to the traction control system automatically. The conditions of this first course require the driver only to keep the front wheels pointed straight so that they don’t dig into the sand; for extra assistance, a graphic on the instrument panel depicts which way the wheels are angled. The other three excursions require more driving skill and greater focus. We venture cross-country until we arrive at a fierce uphill section littered with rocks. Although this hulking piece of Utah granite is not the one encountered years earlier, the net effect is similar; it’s a natural obstacle that represents an out-of-the-ordinary challenge. As we approach the start of the course, Land Rover instructors are scattered about, directing drivers over and above whatever nastiness requires clearing. 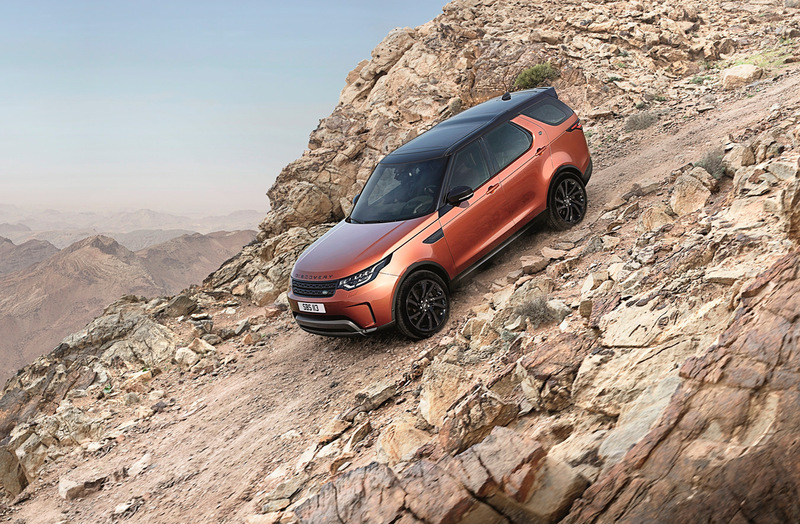 Here, we experience the incredible articulation of all four of the driven wheels, feel the optional air suspension float us above terra firma, and ride along with the Discovery as it spits out sand and rock in search of traction. The final two off-road challenges are more surprising. New experiences can be incredibly rewarding and, despite my familiarity with the Land Rover brand, I’d never previously piloted one through a dry riverbed or over sand dunes. Outside the city of Kanab, we toss the SUVs into the “mud and ruts” setting and fling them down the riverbed like we’re rafters in search of whitewater. But all we encounter are a series of S-bends, bone dry and at times deep with sand, that force the tail end of the Land Rover sideways before things are easily corrected. It’s a thrilling experience, akin to driving a rally car on gravel, where huge speeds aren’t needed to make the heart beat faster. Then, at the Coral Pink Sand Dunes State Park, the pièce de résistance: the chance to power the Discovery through a desert setting complete with tire-swallowing valleys, precipitous hills, and blind drop-offs. If this seems like another insurmountable challenge for the average SUV, you would be correct. For the Land Rover, though, it’s just a matter of keeping the momentum going. This new Land Rover Discovery is tangibly superior to the LR4 (itself a world-class off-road vehicle) in nearly every respect. The fact that the Discovery is equally impressive from a refinement standpoint is perhaps even more noteworthy. 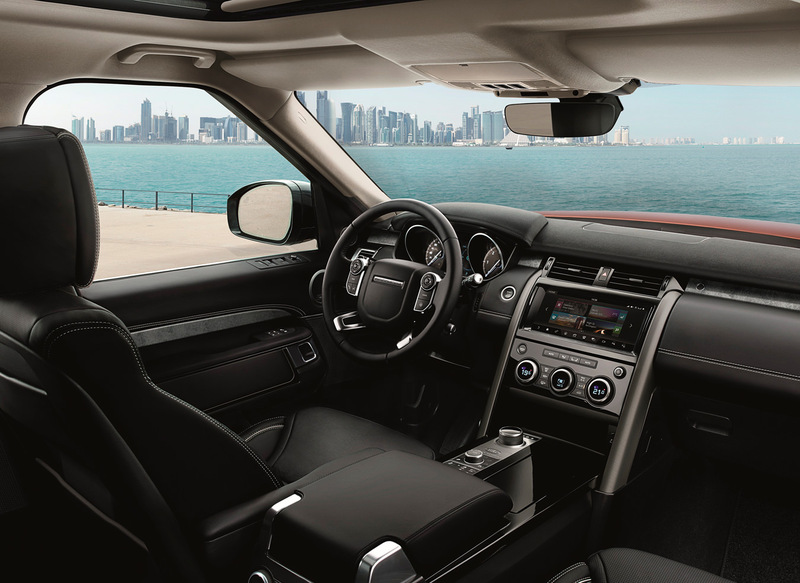 But what is most impressive about the latest offering from Land Rover is the diversity of places it can take you.